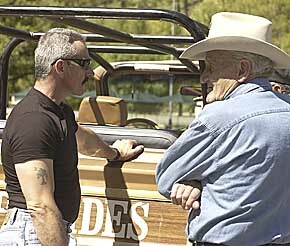 CUSTER STATE PARK - Country-music star Aaron Tippin says the Black Hills are his kind of country. Tippin trekked through the Black Hills on Monday, interviewing locals for an upcoming episode of his show "Made in America." "The people here are friendly, and the pace of life is just right," Tippin said while standing in the shadows of the State Game Lodge in Custer State Park. He had just completed filming a segment of the show with the park's bison as a backdrop. The one-hour episode, scheduled to air on Great American Country television network, will feature a series of segments with Tippin, on site in the Black Hills. Tippin covered more than 250 miles Monday and stomped ground from Mount Rushmore National Memorial to 26,000-year-old mammoth bones at the Mammoth Site in Hot Springs. Tippin met with Nick Clifford, the youngest man to carve Mount Rushmore and interviewed Larry Agenbroad, paleontologist and principal investigator at Mammoth Site. With a filming crew in tow, Tippin rode on a Jeep safari tour through the bison herds in Custer State Park and spoke with Dean Shaffhausen, State Game Lodge tour manager. The daylong tour was scheduled to continue at Saloon No. 10 in Deadwood on Monday evening where Tippin would play Jack McCall and get to shoot Wild Bill Hickok. "I've seen a lot of unique things today. I've never been right up next to a buffalo before. Plus, tonight, I get to kill Wild Bill. What a way to end the day," Tippin said, laughing. Tippin also was scheduled to visit Mount Moriah Cemetery and concluded the evening with dinner at Deadwood Social Club. Tippin's career hit its stride 13 years ago during the Gulf War with the patriotic song "You've Got to Stand for Something." Described by some as the "voice of patriotism," Tippin's lyrics not only speak to his fans but also stirred him as he toured the Black Hills. "Looking at the presidents' faces this morning and with everything that's going on in this world today, I really heard ‘Stars and Stripes' going on in my head this morning," he said. Off-stage, Tippin described himself as an outdoorsman and would like to bring his two sons back to the Black Hills to hunt and tour. "When I'm on the road touring, I just get a peek at all different areas, but being out here like this, you see a lot of cool things to do." The Black Hills episode is expected to air in three to four weeks as part of a 26-episode series. Tippin will continue his trek across America after heading home for a day and a half to visit his family. © 2003 The Rapid City Journal, Rapid City, SD.